Flow cytometric analysis of SK-UT-1 cells (blue) and MCF-7 cells (green) using IGF-I Receptor β (D23H3) XP® Rabbit mAb (PE Conjugate) (solid lines) or concentration-matched Rabbit (DA1E) mAb IgG XP® Isotype Control (PE Conjugate) #5742 (dashed lines). 20X Phosphate Buffered Saline (PBS) #9808: To prepare 1 L 1X PBS: add 50 ml 20X PBS to 950 ml dH2O, mix. Adjust pH to 8.0. Incubation Buffer (1X PBS / 0.5% BSA): Dissolve 0.5 g bovine serum albumin (BSA) in 100 mL 1X PBS. Store at 4°C. Permeabilization Buffer (1X PBS / 0.3% Triton™ X-100 / 0.5% BSA): To prepare 10 ml, add 30 µl Triton™ X-100 to 10 ml Incubation Buffer. Resuspend cells briefly in 0.5-1 ml PBS. Add formaldehyde to a final concentration of 2-4% formaldehyde. Fix for 15 minutes at room temperature (20-25 °C). Wash by centrifugation with excess 1X PBS. Discard supernatant in appropriate waste container. Resuspend cells in 1 ml Permeabilization Buffer. Aliquot desired number of cells into tubes or wells (suggested range of 0.5x106 to 1x106 cells). Centrifuge cells and discard supernatant. Resuspend cells in 100 µl of diluted conjugated primary antibody (prepared in Incubation Buffer at the recommended dilution). Incubate for 30-60 min at room temperature (20-25 °C). Protect from light. Wash by centrifugation in 1X PBS. Discard supernatant. Repeat. Resuspend cells in 1X PBS and analyze on flow cytometer; alternatively, for DNA staining, proceed to optional DNA stain (Section D). Resuspend cells in 0.1-0.5 ml of DNA dye (e.g. Propidium Iodide (PI)/RNase Staining Solution #4087). 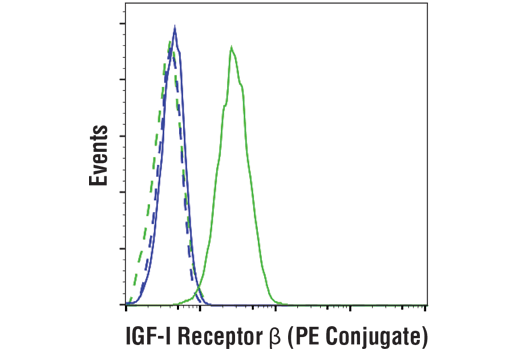 IGF-I Receptor β (D23H3) XP® Rabbit mAb (PE Conjugate) recognizes endogenous levels of total IGF-I receptor β protein. This antibody does not cross-react with insulin receptor. Monoclonal antibody is produced by immunizing animals with a synthetic peptide corresponding to residues near the carboxy terminus of human IGF-I receptor β protein. This Cell Signaling Technology antibody is conjugated to phycoerythrin (PE) and tested in-house for direct flow cytometry analysis in human cells. The antibody is expected to exhibit the same species cross-reactivity as the unconjugated IGF-I Receptor β (D23H3) XP® Rabbit mAb #9750.